Crocosmia Lucifer blooms in mid-summer with sprays for bright red flowers borne on thin sturdy stems. It grows to a height of up to 40 inches. Crocosmia Lucifer grows from a bulb-like structure called a corm. It will naturalize or multiply rapidly in USDA Hardiness zones 6 through 7 if protected with mulch in the winter and zones 8 through 10 if unprotected. The leaves of the Crocosmia Lucifer are sword-like and similar to the leaves of a gladiola. The leaves must be allowed to decline so the corm can store energy for the next growth cycle. Find well-drained location that receives at least six hours of sun daily to transplant the Crocosmia Lucifer corms in early spring. Dig into the area where the Crocosmia Lucifer corms are located with a shovel. Dig 6 to 8 inches from where the corms should be located to prevent damaging or cutting them. Begin digging by gloved hands when the soil is loosened. Place the corms in a dry bucket with a small amount of soil over them to help keep in moisture. Don't add water to the corms while they are in the bucket. Clear the new planting area of all weeds. Cover the planting area with 1 inch or more of compost. Work the compost gently into the top 6 inches of soil with a rake or a hoe. Rake the new planting area smooth. Plant the transplanted corms 4 to 6 inches deep, counting from the bottom of the corm, and 4 inches apart. Cover the newly planted corms with soil and compost mixture. Keep soil damp but not wet until the leaves appear later in the spring. Crocosmia Lucifer makes a good cut flower. Cut at the base of the stem without damaging the leaves when two or three flowers are open at the base of the stem. The other flowers on the stem will open in a few days from the bottom up after the cut end of the stem is placed in clear water. Crocosmia can also be grown successfully in a container. 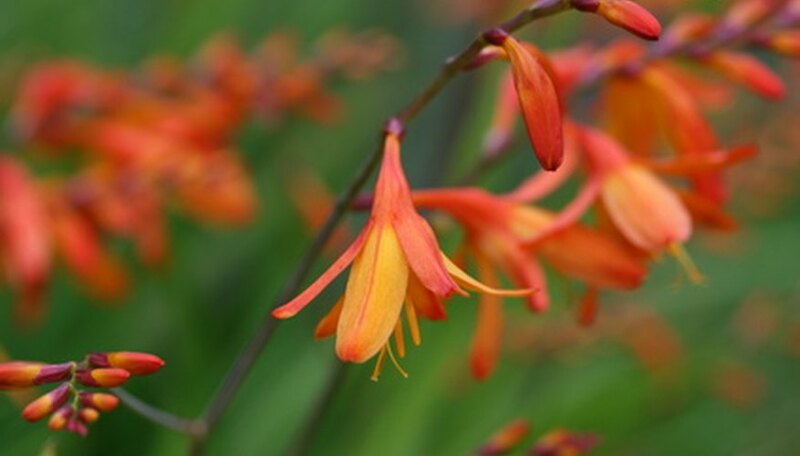 Because the flower stems or so thin and wiry, it makes a better show if Crocosmia Lucifer corms are planted in groups of 10 or more rather than a straight line such as a border. Crocosmia corms usually are no more than 2 inches across and no more than 6 to 8 inches deep. Crocosmia corms will rot if planted in heavy clay soil that holds water.